Prime Minister Mark Rutte of Netherlands dropped his cup and spilled coffee at the spotlessly clean entrance of the Ministry of Health, Welfare and Sport building in The Hague. He immediately took a mop from a cleaning lady and began to clean up. In Netherlands, this is no big deal. As per etiquette, people, famous or ordinary, VIPs or commoners, are expected to clean up their mess. A reporter from Dutch broadcaster NOS was at hand and he filmed what the PM did after the spill. Now, it is all over the social media and drawing praise from people in countries where no politician or celebrity worth his two-bit salt would ever do a thing like this. In India, people are amazed how the Prime Minister could take the mop himself when he could have just ordered the cleaning lady to do the job for him. They are also amazed that a group of cleaning ladies could have the courage to stand by and watch and then applaud Rutte for a job well done. The security in our country would never allow the cleaning staff to come anywhere near the PM. Further, let alone the PM or other political leaders, whenever there is a political rally in India, the ground where it is held is in complete mess. Indians do not believe in cleaning up after themselves and that is why the Swachh Bharat Abhiyan has not been a success despite repeated attempts. Before pointing fingers at leaders and celebrities, Indians would do well to look within. The way we behave in public spaces, one is surprised that no one filed a petition against the Swachh Bharat campaign to claim that no one could ask us to clean up as littering was one of our fundamental rights. We do not have any manners or etiquette when it comes to keeping our surroundings clean. We believe that it is the job of the corporation, municipality or the panchayat to clean up our mess. We even find it tiresome to walk a few steps to the dustbin, throwing waste where we stand. People do not think twice before throwing things out of the window, or a running car or public transport. Unless this mentality is given up, India can never be clean. 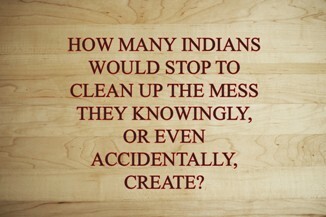 And Indians should never expect a politician or celebrity to do a Mark Rutte-type clean up. After all, what are safai karmacharis for?